It’s been a while since I last read a scary book. I think the last one I read, that I liked, was The Passage by Justin Cronin. So, I don’t have a lot of experience, or many books to compare this one to, but for me it was a page-turner, and a lot of fun to read something scary for a change. Also, the front of the book has an endorsement by Stephen King. If he liked it, it must be good, right? In the acknowledgments, Nick Cutter also thanks Stephen King for the inspiration from his novel, Carrie. The story in The Troop is told using newspaper clippings and interviews from the investigation interspersed with the narrative, in the style King used for his novel, Carrie. I am going to try to write about this book without giving anything away. 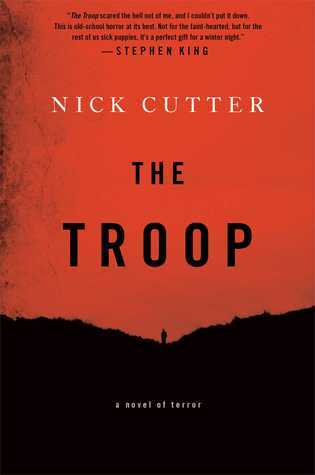 The Troop tells the story of a group of five boys gone off on a weekend camping trip with their Scoutmaster, on an island off the coast of Prince Edward Island. A very hungry, skeletal, sick man shows up on the island with them, and Scoutmaster Tim, being a doctor, invites him into the cabin to try to help him. But he is beyond help, and now so are the rest of them. There is something terribly wrong with him, and it is extremely contagious. What I liked most about this book was reading about the interactions between the five boys. We get to know each of them and a bit about their backgrounds, then we watch how they work together (or don’t) when crisis hits. Scoutmaster Tim: A responsible, caring adult who sincerely cares about these boys, and likes taking them out to spend time with them. He biggest fault, I think, is that he doesn’t bring another adult with him on their trips. If he had followed that simple rule, maybe none of this would have happened. He’d tried so hard, under such desperate circumstances, to make the right choices-how was he to know it would turn out so horribly wrong? Kent: The son of the town police officer, he is over-confident and a bit of a bully, sure that he is always right and the others should fall in behind him. Because he is so sure of himself, that is exactly what the others do, most of the time. His father taught him well. It’s all how you present yourself, son. Draw yourself up to your full height. Stick your chest out. If you look like you’ve got all the answers, people will naturally assume that you do. Ephraim: The boy with the anger-management problem. He comes from a tough background with a father who is in jail. His mother is always reminding him not to turn out like his Dad. Ephraim’s anger rose out of nowhere, this giddy charge zitzing through his bones and electrifying the marrow. His rage was a dark cloud passing over the sun where just moments before the sky had been clear blue. Max: Ephraim’s oldest and closest friend. Max seems to come from a home with loving parents. His Dad is a taxidermist and runs the morgue. They’d made a pact to be friends forever, but forever could be so, so brief. Newton: The nerdy one, the one everyone picks on. He’s interested in learning, pays attention, and is, of course, a bit chubby. At home, it’s just him and his over-protective Mom. But when things get rough, he keeps his head. That was the biggest part of survival, Newton realized: maintaining a belief in the best-case scenario. It was when you started to believe the worst-case one that you were doomed. Shelley: Shelley is the strange one. No one can really figure him out, so they just ignore him, let him be. He seems to come from an ordinary home, but the things that go on in his mind are not ordinary. At times, I thought he was creepier than the ‘contagion’. The boat wouldn’t come. Not today. Not for a while. Maybe not ever. And that was just fine by him. That meant he could play his games. 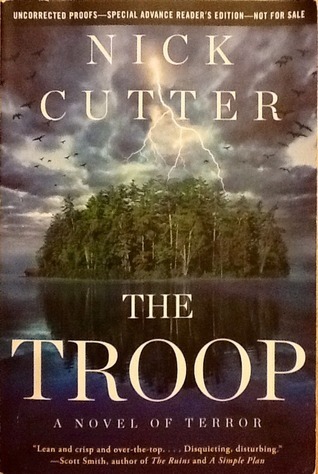 I was a little nervous about reading The Troop at first, because my husband and two of my children go to cub camp on a regular basis. But it hasn’t bothered me at all. However, if you’re squeamish, you might not want to read this book. There are many deliciously disgusting descriptions. The ones below are a few of the tamer ones I picked out, to give you a sneak peek. Whatever was wrong with him, this sickness, it was rampaging. Barnstorming through his body, devouring him. Fingers slipped through the gap between the doors. They did not look like anything that ought to be attached to a human being: shockingly spindly and so awfully withered, like ancient carrots that had been left in a cold, dark fridge so long that they’d lost their pigment. None of them had fingernails-just bloody sickles rimmed by shreds of torn cuticle. It feels empty. There’s a hole and it keeps getting bigger and bigger and bigger. Forever and ever and ever. It wants me, Shel-and it wants you, too. Wants all of you. How could you hide from a murderer who lived under your skin? I especially enjoyed this mosquito scene. Some people might find it more disturbing then the rest of the book. Tim felt them everywhere, their bloodless legs dancing on his flesh, the maddening whine of their papery wings filling his ears. He slapped wildly, barely tamping down the sudden yelp that rose in his throat. A semisolid wall pulsed on every side-a buzzing, biting, poisonous shroud. In his ears, tickling his nose, fretting at the edges of his eyes. His hands were sticky with pulped insects. He thought about Gulliver tied down by thousands of Little People-a scene that had never stirred fear in him until now. The prospect of being beset by thousands, millions, of tiny assailants was actually quite terrifying. I think one of the reasons this horror novel worked for me is because the “monster” in the story seems scientifically plausible. It is not some kind of ghost or fantastical creature. And, like I said before, the interactions between the boys was fascinating, reminding me of Lord of the Flies. What kinds of scary books have you liked? Ooh, it’s been a long time since I read a proper thrilling thriller. Is it just me or is the genre out of fashion? But this one sounds delicious, and I am probably sick or something, but I love that mosquito scene you quote here. I love the mosquito scene, too, just because we all hate them, right? A whole book about being pursued by mosquitoes might be enough to freak anyone out! I thought it was a great scene to add to a horror novel. This sounds so great Naomi, I LOVE a scary book. I have The Passage in the 746, have you reviewed it? One of the scariest, cleverest and most thrilling books I have ever read is House of Leaves by Mark Z Danielewski. Seriously good, but seriously creepy! Thanks for the recommendation, Cathy! I’ll check those recommendations out as well! I don’t go for scary stories they way I used to, but I think I would like this book. There was a lot of buzz in the media about this book. Is the author Canadian? Yes, Nick Cutter is actually Craig Davidson, the author of Cataract City, which was shortlisted for the 2013 Giller Prize. Why do authors write under different names if it is not for anonymity? I don’t get it either. Also, considering all the media attention the book received, wouldn’t Nick/Craig want to be recognized as themselves for their writing? I like that there’s a bit of boy psychology in this book and I would read it for that alone. I do wonder if I can stomach the “disgusting” parts! This sounds intriguing enough for me to look up though. Like you I haven’t read a lot of scary stories but I’m quite interested in them. I’m glad you liked this one. I would also prefer that a horror/ghost/etc. story have a plausible explanation. I’m a little afraid you won’t like a lot of what goes on inside the boys’ heads, but for the boys the author chose to write about, I thought it seemed realistic. It wasn’t all bad. Many times their stories made me feel sad and protective of them. Lucky for me, horror books don’t scare me the way horror movies do. This is good because I hate being scared… but then you ask what my favorite scary books are, and I’m sort of at a loss. I did really like The Passage though. Horror books don’t scare me very much either, which is good. A little scare and suspense is enough for me. The Passage scared me more than some, but I think it’s because I read it while camping. I was imagining the virals up in the trees above me as I read my book in the dark, by the fire.